In fact, it was a leg. And surely it was Roberta’s leg. It must be. Because things always work out in the end, don’t they? Missing parts are found. Siblings are reunited. Parents return from another dimension. That’s how stories move along: from chaos to happily-ever-after. That’s the point of a story. Nancy looked away from the glittering, beckoning chimney/robot leg only to find that Joe and Genius Kelly were engaged in a shocking act of vandalism. They were eating the gingerbread house. “But it’s good,” said Joe. “I think it’s great!” said Joe. He was shoving huge chunks of a gingerbread windowsill into his mouth and swallowing without even bothering to chew. Such greed! Such hunger! Nancy found it disagreeable. Her stomach, however, was not as principled. It growled in jealousy. “Both of you should stop eating,” she said. “One, it’s rude to eat someone’s house. Two, haven’t you ever read Hansel and Gretel? “Read who and who?” said Genius Kelly. It was obvious that the pig’s inherent pigginess was winning out over his honor, his commitment to his sacred duty of guarding Nancy and Joe. It was frightening to Nancy to see how one’s baser nature could so easily come to the fore. Joe shoved more gingerbread in his mouth. He swallowed. “I think there’s some even better food inside. I can smell it. It smells like, um. . . .” He put his nose up in the air and sniffed. His chin was covered in crumbs. His nose twitched. “Meatballs,” said Joe. He nodded. He burped. “Did someone say ‘meatballs?’” said a voice that was funny, but not that funny. 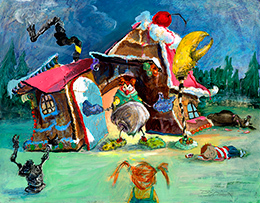 The door to the gingerbread house swung open. A clown stepped out. He was wearing floral-patterned oven mitts on both his hands. “Bbbpp,” said Joe, spraying crumbs everywhere. Would the Sloppy twins ever truly shed their circus past? More to the point: would they ever truly rid their life of clowns? “You sorry excuse for a—,” said Genius Kelly. And then, midsentence, the pig fell right off his four cloven feet and onto his side. “Genius Kelly!” said Nancy. Was he dead? Could it be? The pig started to snore. “Oook,” said Joe, his mouth too full for proper speech. He pointed with a chunk of gingerbread house at the pig. He laughed. “Eee afleep!” And with those words (or whatever they were), Joe, too, fell from his feet onto the forest floor and descended directly into a peaceful, unconcerned slumber of his own. “You drugged the gingerbread?” said Nancy. “Yes,” said Boppo. He smiled at Nancy. His lips were very, very red. “Dearie,” he said. And that one word, that one insincere endearment, was truly chilling to hear. The very forest trembled with the sound of it. The world grew still. A lone, brave bird sang. And from inside the gingerbread house, an oven timer dinged. The clown disappeared. Nancy ran over to Joe. She kneeled down and slapped his face gently. And then she slapped it not so gently. “Wake up,” she said. “Joe, please. Wake up.” Joe had an idiotic, carefree smile plastered on his face. It was annoying. Nancy turned to the pig and slapped him just for the satisfaction of slapping someone. Boppo returned. He stood over Nancy with his oven-mitted hands on his hips. Roberta! Nancy had forgotten all about her. She turned. Roberta was sitting on the forest floor. Both her arms were raised above her torso. She was reaching for her leg, which was perched high above her on the roof of the gingerbread house. The robot let out a sad toot. To be so close to one of her missing parts and yet unable to reach it had obviously unhinged her. She was diminished, undone, frozen into immobility by her longing. 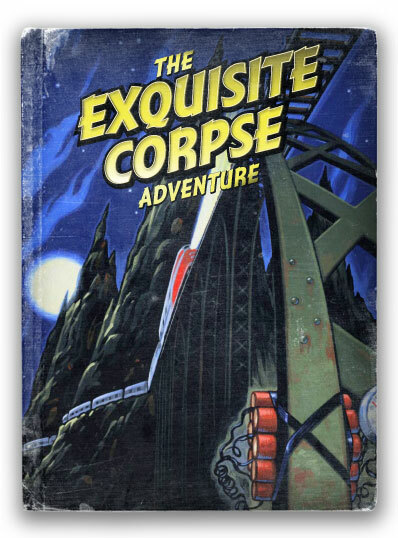 And to Nancy, it suddenly seemed untenable that everything depended on a few pieces of mangled metal named Roberta. But everything did depend on her. And then they both sprinted toward Roberta. Boppo got there first. No one ever thinks that clowns are fast, but they are excessively speedy. Deceptively so. “Ha!” said Boppo. “I’ve got a better idea. Why don’t you come inside and have a meatball and we’ll read some poetry and then you can watch while I take your robot apart? “Are you kidding?” said Nancy. This was a rhetorical question. But, really, what choice did Nancy have? It’s an actual question. I want you to answer it. She could have walked away, of course. She could have abandoned her sleeping brother and the worthless pig. She could have left the half-assembled robot to her fate of being taken apart entirely. But then, the mystery would be unsolved, the corpse unassembled, her parents unfound. Also, it wouldn’t be moral. And so Nancy went into the house of the clown and sat with a plate of meatballs (they smelled delicious, but who knew what kind of Boppo-poison they contained) in her lap while Boppo read aloud to her from his tattered copy of the collected poems of Edna St. Vincent Millay. Roberta, in her reduced state, seemed to enjoy the poems. Rumbles and toots and whistles emanated from her torso; but Nancy was too distracted to derive much pleasure from poetry. How could she get Roberta’s leg off the roof? More to the point: how could she stop Boppo from taking Roberta apart entirely? How could she, Nancy, work to put things together? Would Joe ever wake up? Did she really care if Genius Kelly ever woke up? Man, she was hungry; should she eat a meatball? These were the questions that bedeviled her. Meanwhile, Boppo was reading a poem called “The Ballad of the Harp Weaver.” It was a very long poem and Boppo was crying as he read it. Big, fat tears rolled through his white clown makeup and left streaks of pink skin behind. His hair was, of course, standing on end; and the book of Ms. Millay’s poems looked very small and pathetic clutched in Boppo’s big oven mitts. And then, suddenly, Boppo stopped reading. No, even better: the clown was asleep. “Ha!” said Nancy. She stood up. She put down the plate of meatballs. And without any moral agonizing at all, she bent to the sleeping clown and emptied his pockets. He was a shockingly predictable clown: red rubber nose, red rubber nose, brown rubber rat, another red rubber nose. A meatball. Another red rubber nose. No, wait. This nose was different. It pulsed. It glowed. It wasn’t rubber and it wasn’t a nose. Nancy held the red, glowing thing aloft. Beside her, Roberta’s torso came to life. The robot chirped and sang. Her arms waved back and forth. She emanated hope. And Nancy suddenly realized what she held in her hand. It was the robot’s heart. A shadow darkened the doorway of the gingerbread house. Dear Joe. Reliable Joe. He was awake. They would put Roberta together. It would all work out! But it was not Joe. Oh, no. This shadow belonged to another.